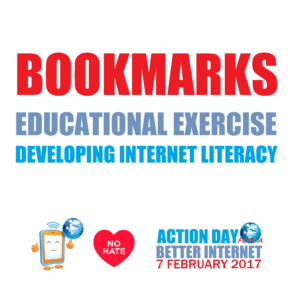 The Movement is recommending this exercise that is especially suitable for the Safer Internet Day on 7th February to implement in a classroom or in an youth work context. 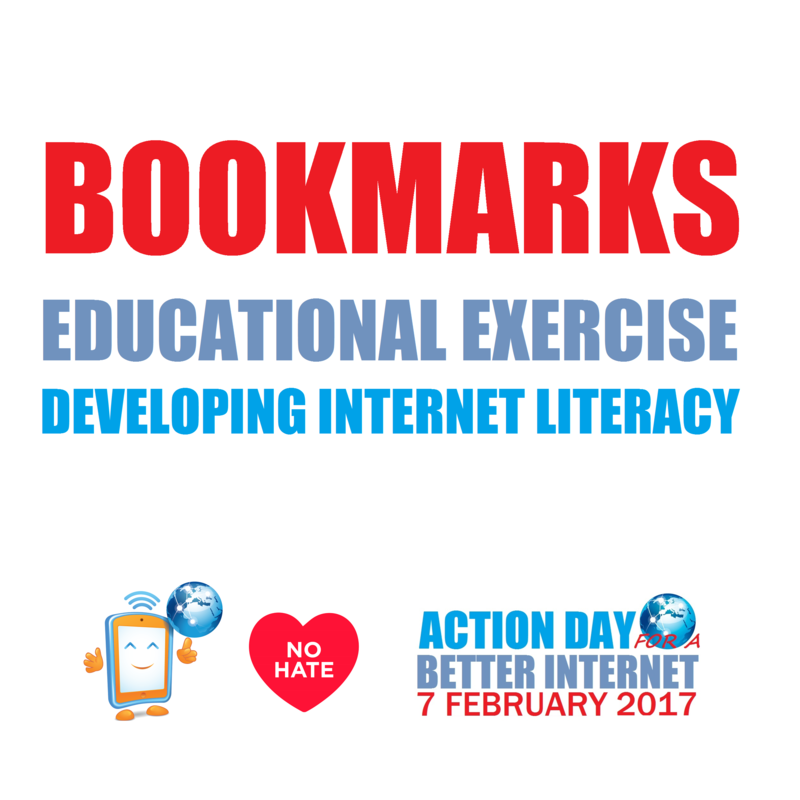 This exercise is taken from Bookmarks, Manual on combating online hate speech through Human Rights Education (Revised Edition 2016, page 87) Available in 12 languages. Participants are introduced to the Guide to Human Rights for Internet Users. They have to analyse key messages and statements of the Guide and to reflect on its application in daily life. • Copy of the simplified version of the Guide on page 90. • Copy the simplified version of the Guide and cut into 7 parts for small group work. 1. 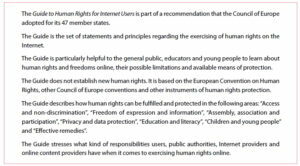 Make a small introduction of the Guide to Human Rights for Internet Users using the description below, or the short version on page 206. 2. Explain to participants that they will read and work on 7 different areas of the Guide. 3. Divide participants into 7 small groups. Give each group one area of the simplified version of the Guideon page 90, and ask them to read it. about. Ask the groups not to tell each other what their performance is going to be about. 5. After 15 minutes of preparation, have every group present their performance. 6. Allow a few minutes after each performance for feedback. Ask the other groups to guess what human rights the performance illustrated. 7. Then give the group itself one minute for a short explanation of what they tried to reflect from the content they read. Write their ideas or messages on flipchart paper. 8. Repeat this for each of the performances. What new information about your rights have you learnt from this activity? Is there any difference between human rights offline and human rights online? 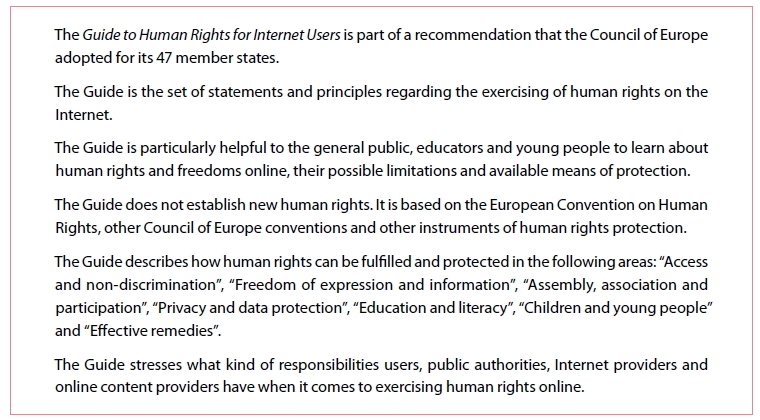 Who has the responsibility to apply these rights online? do? What should the website owners do? when they come across hate speech online? What kind of support one can get from the Guide in combating hate speech online? Familiarise yourself with the full version of the Guide to be ready for the introduction and participants’ questions. When participants discuss their role in promoting human rights online, ask for specific examples of what young people can do in their daily online activity. or to express their ideas in some other relevant and creative way. You may establish with your group a list of key points regarding what Internet users should know about their rights online. You may check with your group who the institutions and organisations protection human rights online in your country are. Invite participants to join the No Hate Speech Movement youth campaign at the European level or in their own country. They can also prepare a photo, meme or video about human rights and hate speech online, based on the ideas they expressed in their performances. As the result of the activity, participants can elaborate action plans promoting human rights online among their friends, schoolmates, and so on. Access to the Internet and non-discrimination. Anyone should have access to the Internet without discrimination by gender, age, race, colour, language, religion or belief, political or other opinion, ethnicity or sexual orientation. If you live in rural and geographically remote areas, are on a low income and/or have special needs or disabilities, authorities should facilitate your access to the Internet. Freedom of expression and information: Anyone has the freedom to express themselves online and to access information online. There can be limits to this in case of expressions which incite to discrimination, hatred or violence. You may be able to mask your identity online, for instance by using a pseudonym; however, in some cases your identity can be revealed by authorities. Assembly, association and participation: Anyone has the right to associate with others using the Internet and to protest peacefully online. You may choose any online tools in order to join any social groups or participate in public policy debates. Privacy and data protection: Anyone has the right to private and family life on the Internet. This includes the confidentiality of your private online correspondence and communications. Personal information should only be used online if people previously agreed to this. Public authorities and private companies have an obligation to respect specific rules and procedures when they process your personal data. Education and literacy: Anyone has the right to education, culture and knowledge online. You should be supported in developing skills to understand and use different Internet tools, and to check the accuracy and trustworthiness of content and services that you access. Children and young people: Children and young people are entitled to special protection and guidance when using the Internet. You can expect training from your teachers, educators and parents about safe use of the Internet. You are entitled to receive, from authorities, Internet service and content providers, clear information about illegal online content or behaviour which can harm you. Support and help: Anyone has the right to receive help and support when their rights are not respected online, including the possibility for having access to a court. An Internet service provider (providers of access to online content) should inform you about your rights and how to complain about violations. Your digital identity, computer and the data it contains are protected by authorities from illegal access, forgery and other fraudulent manipulation.